Surely Big Pharma corporations are spending their cash on research ‘for the cure’ and finding ways to implement life-saving ingredients into their next formula, right? 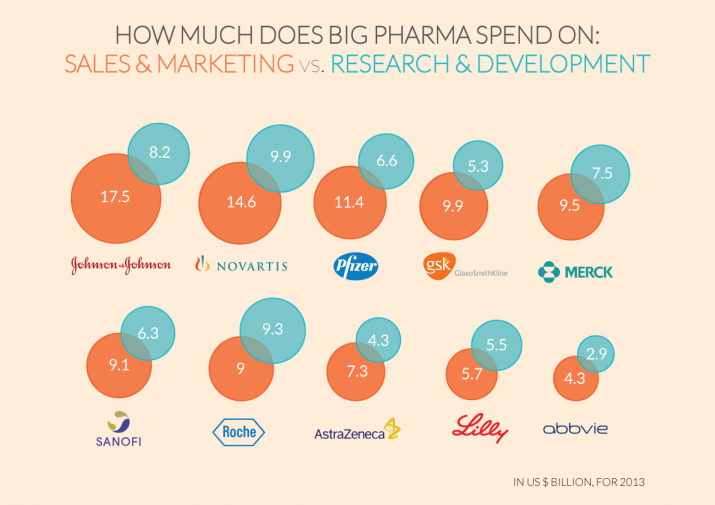 As it turns out, 9 out of 10 Big Pharma companies actually spent more on their sales and marketing than their research and development. When we put this spending into perspective, it’s much easier to see how Big Pharma pushes drugs on the public that are absolutely riddled with side effects and still somehow manages to make a massive profit. Even standard pharmaceuticals come with a long list of over 70 side effects, with some clocking in at side effect counts that reach beyond 500. So how do they do it? Quite simply, they spend billions marketing their pharmaceuticals with smiling models and nature-filled backdrops. I read years ago that they also spend more on lobbying than on R&D, although I don’t have a link for it.